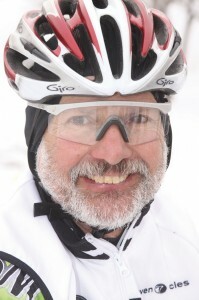 Interview with Lou Melini on April 14, 2011 by cycling utah’s publisher, David R. Ward. Lou Melini has to be one of, if not the, most longstanding bike commuter, bike tourist and bicycling advocate in Utah. He has lived in Utah for 32 years, and been a commuter, tourist and advocate since his move here. Lou writes cycling utah’s Commuter Column as well as book reviews and touring stories. He’s a former chair of Salt Lake City’s Mayor’s Bicycle Advisory Committee (MBAC). Dave asked Lou about his background, experiences and perceptions of biking. CU: Let’s start out with your background. Tell me where you are from and what your profession is, and give me some information about yourself. LM: I’m originally from New Jersey if you can’t tell from my accent. I have been in Utah for 32 years now. I came to work in the children’s hospital as a physician’s assistant in general pediatrics. I have been in pediatrics for 32 years. CU: Are you still with Primary Children’s? LM: No, I’m in private practice. I haven’t worked with Primary since 1991. My wife still works there. She is a nurse practitioner in the emergency department. CU: Where do you work? LM: Wasatch Pediatrics. We rent space in the Women’s Center there at St. Mark’s and then we cover the nursery. CU: When did you initially get involved with cycling and what led to that? LM: Good question. Earth Day 1971 to be specific. What lead me into cycling? It was a time of change, environmental awareness. There were protests against the Vietnam War; a lot of us went to college to get out of Vietnam. You were probably the same way. You got a 2-S deferment, I assume. CU: I went on a mission for the LDS church and during that time they did away with the draft. LM: And they had a lottery. CU: Right, and I was too far down in the lottery. So it wasn’t a problem for me, but I had also had operations on my feet so I was told that I wouldn’t be drafted anyway. LM: You were lucky. Most of us got our 2-S deferment, and then I think it was in 1971 or 1972 when the lottery came in and my number was really high so I didn’t have to worry about getting drafted because of my high lottery number. Anyhow, as a result of that environment we were in, there were a lot of issues with air pollution and recycling, etc. and so forth. So I got caught up in that. As a way to reduce air pollution, somehow I got involved, I got a little 3-speed. I used to ride around campus with it instead driving my car around campus. I went off campus with it, took little rides with it, and pretty much that’s how I got started. Then I bought a 10-speed at Sears where I used to work, and my buddy Jeff and I, we would ride these 20 mile rides up to New Hope, Pennsylvania, a little hippie town, if you want to call it that. They used to have this great homemade ice cream parlor way before people had these little ice cream parlors. Then we ended up riding across the United States in 1975, Jeff and I, as a result of that, I assume. Both of us were bored with our jobs at the time. I was a tax auditor at that time and Jeff had his Ph.D. in sociology and was teaching at the Bowling Green and both of us were bored out of our minds. So we spent 11 weeks riding across the United States. It changed both of our lives. I changed and went into medicine, became a nurse at that time. I wanted to learn more about the human body, and so forth. Jeff is, actually he was just now a vice-president at Dunkin’ Donuts, but he’s got an MBA and is in the corporate world. He quit Dunkin Donuts and is a CEO for a group of investors that just bought like 32 Burger Kings and 20 Papa Johns. They have a little bit of money behind them. Anyhow, we rode across the United States in 1975 and fell in love with cycling. I just dream about [bike touring] all the time. It’s almost an obsession to go bike touring because it was such a memorable experience. It changed me personality wise, changed my goals, changed how I, you know, I mean I went from a crappy student to scoring top in the country when I got into nursing and PA studies. It’s changed me immensely. I mean, I was one of the last, bottom of my graduating class in my first go around, but it changed me. The ride across the country changed me in innumerable ways that I can’t even describe. People that knew me before in the early ‘70s would probably be scared to have me examine their kids at this point, knowing me then [compared] to now. But it was a memorable experience and it has just taken off since then. I like bikes, I like riding them and it has become a lifestyle with me. CU: What was it in particular that made it memorable? LM: Nixon was in power at the time and he was a crook. I had people invite me into their homes; it was just the freedom of being on the road. I had never been in a situation where I had to make a lot of decisions. We had to decide every day where we were going to eat, where we were going to sleep, where we were going to go, how far we were going to ride, we had to deal with the elements. It just gave me this “can do” attitude. For most people, riding across the United States was no different than flying to the moon. So I had done something that very few people ever had done. I came back home almost with a hero’s welcome to some people. It gave you self-confidence, it changed my personality immensely. I was just, I don’t know how to describe it, I became more assertive, more confident, more independent in what I could do and what I could not do. I moved from New Jersey to here. It would have been completely unheard of for me to do something like that prior to that ride. I would have been too scared to do that. There is just no way I would have had the self-confidence to do that before that ride. LM: Until you do it . . . If you go out and do it then you understand what I am talking about, doing something like that. That’s why I tell kids now, go ahead and take off for three months. Go backpack or ride or whatever and just find yourself if you are not sure what you want to do. Parents think I’m nuts when I suggest that to their kids but, you know, it made a huge impact on me and I think there is something to be said for these types of adventures that kids can go on to find themselves and maybe sit down and think about it when they are away from their parents or away from pressures, and take and sort themselves out. LM: I wish I could give you a black and white answer on that, I can’t. There is just too much. All I can say is that it was a fantastic journey and it changed me forever. CU: Since that time, since you got involved in cycling, give me sort of a chronology of what you have done in cycling. LM: I haven’t done all that much. I think if I have done anything with cycling, I have set an example of what one can do with a bicycle as a means of transportation. I have done a lot of bike touring. I have never been a great racer, as you know. I mean I tried it, but it wasn’t something I aspired to and I wasn’t a great racer. There are certainly people in the advocacy world that have done a lot more than I have, immensely more than I have. I was president of Bonneville Bicycle Touring Club [now Bonneville Cycling Club, or BCC] back in 1980 – 1981, but I am certainly not a leader and I don’t have that leadership quality. Certainly people who have been president of that club since then have done a lot more and have built that club into the wonderful organization that it is now. Back in 1980 and 1981 we had a small number of people and had a few rides a year. So I don’t think I have done a whole lot but I do think I have set an example of what can be done. I don’t have a car. I haven’t owned a car in ten years. LM: Yeah. I don’t miss it. I get around. My wife has a car and I borrow that if I have to go to Home Depot and pick up twenty bags of compost or whatever. It is kind of tough to do that on a bike. This last week when I was sick, my kids had to drive me to the doctor’s office and the hospital, but I don’t think I was in a car but once or twice since the first of the year. I was in a car a couple of times until this last week when I was sick. I had to be taken to the doctor’s office and to the hospital. So, I think if anything I set an example of what one can do on a bike and to me, unless more people out there are using their bike in an utilitarian fashion, the politicians aren’t going to really address our needs until there are more people flooding the streets on a regular basis, going to the store, going to work, going to restaurants or whatever. Just setting an example. If I have done anything in cycling, that is pretty much the best I have done is set an example for others to say, yeah, you can live on your bike and you really don’t need to drive a car all of the time. CU: Okay. So you mentioned racing. When I got involved in racing, I don’t recall if you were involved much. I just remember your name from back then. LM: I started racing in the early 1980’s. Mike Stephen got me involved so I think it was about 1981 or 1982 when I did my first race. We always had the criteriums you remember at the International Center and even at Research Park. Ron Hammer, I helped him put on a few races. With my second child, I pretty much got out of racing because as you know racing is like a part time job. LM: That’s when I quit racing. I was an official for the USCF, now called USA Cycling, up until 1990. I just worked at the Moab race and that was about it. They had a stage race there with the Groff Brothers who started Rim Cyclery. I pretty much just ran the Moab Stage Race. LM: I might have done one or two local races as a token official. I worked at the Masters Nationals when it was in Park City and I think I worked at the Nationals when they were at Jeremy Ranch as a minor official. But, otherwise, I just primarily worked at the Moab Stage Race. Again, I just don’t have the personality to be a, you need a pretty forceful personality to be an official. I was a referee in soccer as a linesman for seven years, but other than that, I just don’t have the strong enough personality sometimes necessary for being an official. I left being an official because those who were the officials screwed nationals up royally in my opinion. You remember Tom Carr. LM: They basically robbed him of the Over 30 National Championship because of some things they ruled on that basically screwed him over. It was unfortunate. It really ticked me off. CU: It would be fair to say that your passion with cycling is more toward touring and utilitarian uses. LM: Exactly, utilitarian uses of the bike. Absolutely. That is how I got started. I was reducing air pollution back on Earth Day in 1971, traveling across the country. My passion is definitely with the utilitarian use of the bike. LM: I do cyclocross racing now which is really a lot of fun. LM: Oh, yeah. It’s been a blast. I have done that for the last seven years. [Cyclocross] is fun, it socially is a lot of fun — but still my passion is the utilitarian use of a bike. CU: Tell me some the highlights of tours you have done and maybe some experiences. LM: Every tour has been a highlight. I can’t remember a bad tour that I have done. I have been in some nasty weather but that is part of the tour and part of the adventure. Obviously, the grand tour for me was riding across the United States, but that’s small potatoes compared to some of the tours that people have done. Last year, I had eleven cyclists stay at my house from seven different countries. One [Japanese man] had been on the road for six years. I correspond with another Japanese fellow, he – in fact I am writing an article on these guys – he traveled for 13 years? From 1998 -, 11 years. He went home in 2009. He left Japan in 1998. I corresponded by email with him almost the entire time. In fact I helped him drain an abscess when he was in India, an abscess on his leg. By email, I helped him drain it. It was kind of fun. But Wisconsin is so bike friendly. I want to go back there and do a couple more tours in Wisconsin. You can’t imagine. It is probably the most bike friendly place I have ever been. People will slow down. If there is a no passing sign, they won’t pass you. Double yellow line, they won’t pass you. They will drive at your speed if they can’t pass you. No horns whatsoever. Absolutely none whatsoever. They have got to be the most friendly drivers I have ever met, the people in central and western Wisconsin. Just incredibly great. Wisconsin has a bazillion dairy roads that just go to every dairy farm. You might see a half dozen cars a day on some of these back roads. They have, what, 715 miles of segregated bike trails – old railroad beds. There are four of them connected, 220 miles long. You don’t even see a road other than crossing them for 220 miles. There are campgrounds, bed and breakfasts, and cafés all along the trails. There is a literal economy all around the bike trails in Elroy, Wisconsin. LM: Washington was a great trip. My wife and I rode up to Montana; that was a great trip. My Southern Utah trip was outstanding. I have never had a bad bike tour. Each one is different and unique and wonderful. CU: How many times do you go touring in a year? LM: Since my kids have been out of high school, my wife and I, ever other year, do a three week bike tour starting in 2005 and then we do a long backpack trip on the even years. We walked across the Uintas in 2004, and we have done 80 to 110 mile backpack trips ever year and then we will do some shorter backpack trips. On the odd years, we’ve done three 3-week bike tours and we’ve done a shorter Southern Utah tour. This year, we are supposed to go to Germany. I’m not crazy about it. But my wife just broke her arm so that may be out. She was hiking and fell. She was in Zion and fell and grabbed and broke her proximal humerus. She may be out for six weeks of biking since we were supposed to leave in four weeks. We may have to do a Plan “B” like backpacking or hiking in Europe. I’m not really that interested in foreign touring. I am a life member of the Adventure Cycling Association. They have 40,000 miles of mapped of bike routes and my goal is to do them all. Of course, it is going to be an impossibility but that is one of my life’s wishes, to ride all of Adventure Cycling Association’s routes. CU: Is that how you have made the connections with the people who have stayed in your home? LM: That is through an organization called Warm Showers. The original organization [I joined] was John Mosly’s Touring Cyclists Hospitality Directory. John actually lived in Salt Lake and moved to California. [Ed. note: This organization was discontinued in 2006 and members were referred to the Warm Showers organization.] I was one of the first 10 people who signed up in 1976, so I have been having people come to my house for 35 years. Usually I get one or two every two years. Last year I had 11 people. It was really out of character. I have people who were touring for as little as three months to one Japanese fellow who had been on the road since 2005. He did a seven month stint back in Japan. He has been on the road since 2005 and had two more years to ride, he said. There was a Spanish couple who had been riding for a year. A French couple for two years. A German woman doing her first bike tour was riding for 18 months around the world. She was basically a backpacker. She has done the Pacific Crest, the Continental Divide, and the Appalachian Trail. LM: They are fascinating. Basically you are on a list where you can stay in peoples’ homes as long as you reciprocate by letting people stay in your home and its called Warm Showers. That is how people connect with me, is through that. CU: Tell me a little bit about commuting. You have been a commuter then since 1971. LM: Pretty much. There were times when it was tough in New Jersey, and there were times when it was tough, when my kids were little, to be a full-board commuter. I have been a more dedicated commuter since I have been in Salt Lake City. It is much easier to commute. I am closer to my work places, whereas in New Jersey I was a little bit further away. For the ‘70s and for the amount that I was commuting, I was commuting a lot relative to others but it wasn’t nearly what I am doing now. It wasn’t even close to what I do now. Now I live on my bike. Then I commuted if it was convenient. So I would go to work at the hospital. I would have to be there at 3:00. [At the end of my shift,] I would hop in a bed, sleep overnight, work the 7:00 a.m. to 3:00 p.m. shift the next day, then I would ride home, because I worked the weekend shift that way. So I did that kind of stuff. But I was not as dedicated a commuter then as I am now. CU: All right. So how many miles would you say you put on the bike just commuting each year? LM: More than I thought I did. The BCC now has this commuter challenge where you can log on your miles. I’m doing about 400 miles a month. I thought I was doing 250 to 300 a month. But I’m doing about 400 miles a month. With that said, in the nice weather and this time of year, I take the long way home so I kind of pad my miles a little bit but it is still more than I thought I was doing. I go along and pick up aluminum cans for the Scouts sometimes on my little extra jaunts. We use cans to buy merit badges and things like that. We recycle. So yeah, I am doing, right now, I was surprised, doing about 400 miles a month since I have been keeping track of my miles. Which works out to be 4800 miles a year. CU: That is a lot. LM: I am doing a little bit more in the summertime, because I do the long way, but even in the winter months I am still pushing close to 400 miles a month between meetings, running errands, etc. and so forth. CU: You have been doing a column for cycling utah for some time on commuting and doing interviews with commuters. LM: In June, it will be seven full years I have been doing it. CU: I know it has been a long time. How do you connect with the other commuters? LM: Dave Iltis sends me names, sometimes. I have had a few people give me referrals because at the end of the column, there is a “Call Lou if you have a commuter”. A lot of the people I just see on the road and I chase them down on my bike and say, “Hey, I want you in my column”, or I see bikes in the bike rack at work. Or I happen to know someone that is a commuter. So a lot of people I will just see them on the road and I ride them down and get their name or tell them to contact me. It usually works out, but sometimes it doesn’t. A lot of people I just run into them while commuting or riding around. To me it is a way to hopefully generate more people to commute. I have had a lot of good feedback ever since I have been doing the column, where they are reading the column and say, “I commute more” or “I commute longer into the year”. “I feel like I am not the only one out there doing it.” It has been a good column for that. LM: I still think that we would have more cyclists if people used their bikes in a utilitarian fashion. Politicians look at us as a bunch of spandex clad people that ride on Saturday mornings when the temperature is between 55° and 85°, and it is tough for them to take us seriously. There should be bikes strung out at grocery stores, restaurants, whatever. You see a few bikes in front of a coffee house and that is about it. CU: It is certainly true. When you have numbers, that is when you garner attention and influence. LM: When gas was $4.00 a gallon a few years ago, you couldn’t get politicians to stop talking about bikes and things like that. Now that gas is relatively cheap at “only” $3.50 a gallon, when was the last time you ever heard, except [Salt Lake City] Mayor Becker, bring up anything about, you know, we really need to go out because of gas prices and help people ride their bikes. It’s old fashioned. We need to get more people out there looking like Holland or Copenhagen, streams of bikes going down the road on their way to work, on their way to school or on their way to a restaurant or whatever before a politician is going to be serious with us. CU: That was the image I had in mind. We were in Amsterdam almost two years ago and when you mentioned numbers, that is exactly what I thought of, seeing all of these bikes lined up along the canals and the plazas, and you couldn’t look anywhere without seeing a string of bikes lined up, plus all of the people getting around on their bikes. Those are the kind of numbers you would like to see. LM: Absolutely. I will put a plug in for cycling utah. I think we ought to do some stories on bike friendly businesses that have bike rack and who cater to bikes. And on the negative side, if we can legally do it, people who do bad things to bikes from a business point of view, tell the bicycling world about that. They are not friendly toward us and we shouldn’t give them our business. Give our business to people who are bike friendly and promote them. There was a guy who wrote in on the [Salt Lake Bicycle] Collective email chat list that had an ugly encounter with this barber guy who had a barbershop logo on the side of his car, and he came by and was yelling at the cyclist to get off the heck of the road and get on the sidewalk, blah, blah, and giving him a bunch of crap. Well, good, make sure people don’t go to that barbershop. CU: We will have to consider that. LM: People say you put more infrastructure for cyclists, if you build it they will come kind of mentality. My feeling is you could pave the streets in gold and people are not going to ride unless it’s nice weather, whatever. They don’t have the mentality of people like you saw in Amsterdam, and Copenhagen. If it rains, so what, put a raincoat on. You still go to the store, you still go to work. People need to develop that kind of attitude and get numbers out there. CU: I believe that ultimately you get those kinds of numbers when the economic pressures and cost of driving vehicles make people look for alternatives. LM: Absolutely. Right gas is $3.50 a gallon, I don’t hear a lot of people, maybe there are few out there, but my feeling is that the magic number isn’t going to be until it is $6.00 a gallon at least till you see a large amount of people thinking about buses and Trax and bikes or whatever. CU: There has to be something that is really dramatic change and takes a real bite out of peoples’ wallets. LM: Right. Driving is still relatively cheap, despite a newspaper article last week that said AAA figures were over $8,000.00 per year to run one automobile. I don’t know if you saw that. LM: It was talking about annual costs for an automobile and AAA figures were well over $8,000.00 a year. I don’t think that is true in Salt Lake City, it’s a nationwide average. But still it is $4,000.00 or $5,000.00 a year with a middle class vehicle, depreciation, licensing, gas, etc. and so forth. CU: A lot of that, of course, is the fixed cost, not the marginal cost. Most people are going to have cars so they have those fixed costs, purchasing, licensing and those kinds of things they are going to have to pay. LM: And that is the most expensive part of the car. CU: It is, so once they have the car, the marginal cost of driving is not as much, and that is really what has to increase, in my opinion, the cost of gas and things like that. LM: People are kind of blind to costs, like the depreciation and things like that. They’re just blind to how much that costs. CU: How would you compare Utah, and Salt Lake City in particular, to the rest of the country? You have obviously been around the country cycling. How do we compare? LM: I haven’t been around the country that much to be able to compare. I would say my experience in Wisconsin is absolutely . . . They have always been ranked by the League of American Bicyclists as number two. Not in my mind. They are definitely number one. Wintertime is a big negative for Wisconsin, and mosquitoes. Washington was nice. They have a lot of shoulders, a lot of bike lanes; in general it was a good state to ride in. Back east, I haven’t been back east in 30 years to ride. My buddies back there absolutely hate it. They are bicycle unfriendly. One guy just moved from Salt Lake to Connecticut. He says it is terrible, relatively speaking, terrible riding conditions compared to here. I would say overall we have it great here. In terms of the environment in the Salt Lake City area, we are way up there as probably one of the top cities in terms of bike friendliness. We may not have all of the fancy stuff like Portland, but I would say overall [Salt Lake] is a pretty good place to ride. CU: That has been my impression. I have obviously done a lot of riding here and I have ridden in a lot of other places where I have traveled. Frankly, I have always felt despite what a lot of people say, that number one, the drivers are pretty friendly. LM: You’re right; I think overall it is very nice. It is more often overly polite people who end up making confusion at intersections. They are trying to wave you through. It’s like, no, I am supposed to stop. I really am. CU: That’s right. You wish they would just drive like they normally would. LM: They get upset because I stop at a stop sign. It’s like, you know, sorry. I am going to stop first, then proceed through. LM: People throw up their hands like they waving you through, and then they throw up their hands because you stop. It is unbelievable…sorry. Because I have had a couple situations that they will do something, then they will accelerate at you. I have had only two or three incidents like that throughout my 3-plus decades of being here. You know, they hit you, you don’t have a chance. They can say, “He pulled out in front of me.” I have had a couple incidents like that where people will almost egg you on and make you do something in an illegal fashion and then they accelerate at you. Rare! But you still have to be wary of the Trojan Horse as an overly friendly driver. Besides, the law is the law, you have got to stop and proceed, etc. and so forth. LM: If there is a four way stop sign, the first person that gets there first leaves first. I don’t do anything different on a bike that I don’t do in a car. CU: Your wife, obviously, has been involved in cycling as well. LM: She has been. Obviously I have had some influence on her, but she is pretty enthusiastic and a pretty good sport about commuting. It is something that she has always wanted to do and maybe because of her family background, who was completely negative of her doing it when she was younger, and perhaps being a female or whatever, she has been a little hesitant to jump into it like I have, plus she’s been more of a helicopter parent when the kids were growing up. But no, she is a good sport and she is enthusiastic about it, though she is not as passionate as I am. CU: Is she from New Jersey also? LM: No she is from Wisconsin. Actually, believe it or not, it was a funny story when we met and she told me where she lived and figured I would never know it. But on our cross-country trip, there was a roadside rest stop about a mile and a half from her house and that was were my buddy and I stayed, at these roadside rest stops along the way a lot of times. You can’t do it now because that corner is all built up; it is a shopping center now. But we stayed at this roadside rest stop around the corner from her house. She told me where she lived and I said, “Oh yeah, I stayed at that rest stop and camped out there” at such and such street, which was right around the corner from her house, and she was impressed that I knew where her hometown was and actually rode within a half block of her house as we were going to take the ferry across Lake Michigan. We took the ferry across Lake Michigan on our cross-country ride. CU: So how did you meet her? LM: She worked at the Primary Children’s Hospital as well. I was like this far from going to Iowa. The recruiter was really nice; I liked Iowa from a biking point of view. But I kind of wanted to come and see the Southern Utah parks and Yellowstone again, and so from a biking point of view I thought that this would be a little bit nicer, from a National Parks point of view. So I ended up coming here. It was a toss up, though. I was close to going to Iowa. CU: And now 32 years later, your still here. CU: Where would you like to see cycling go in the next 10 to 15 years? LM: Again where I would like it to go, I would like to see a lot more utilitarian cycling. I can’t help but push that part, because again, I think the general public looks at us as a bunch of spandex clad people who ride around on Saturday mornings for a little bit of exercise, and that’s it. They don’t see why they should put in a lot of investment in road improvements for that segment for that. Now, with said, they are also being hypocritical, because they ride around in non-utilitarian fashion as well, going around on car rides or whatever, but they see that as being important whereas cycling is not. I think we need to really ramp up and get more utilitarian in our cycling in terms of where we need to go. We need to get more European-like, and get serious about, our attitude about how to utilize a bike. CU: Realistically, where do you think cycling will go in the next 10 to 15 years? LM: I wish I had a crystal ball. I think a lot of it depends, as you alluded to, on economics, What happens to the price of gas, the availability of gas, that’s where the rubber hits the road, because we have had more than 100 years since Henry Ford sought to make cars for the masses and I don’t think we are going to change 100 years of attitude in our country until economics forces us to do that. Will Rogers in the depression, said that people will drive themselves to the poor house, in reference to automobiles. That was in the 1930’s, that quote by him. And he is right. People will literally drive themselves into the poor house because of such passion or habit or whatever you want to call it for driving an automobile. Vehicles were a status symbol. If you look at all of the descriptions and the advertising, how is a car described? There is nothing but pleasure. What is wrapped up in bike commuting? How many people really care? People don’t care about that stuff, it saves the Earth, it reduces air pollution. These things are not going to sell bikes. You need to sell bikes on their practicality, their money saving, on their longevity, how long they are going to live. People are going to get so fat and diabetic that they hit bottom. They are going to have to get on some type of exercise machine in order to loose weight and control their diabetes and things of that nature. We haven’t hit bottom in our country either economically or healthwise yet for people to change their attitudes. Realistically, where are we going to be in 10 to 15 years? We are going to be stuck in the same rut where we are at right now. As long as gas stays relatively cheap. CU: Yes. I tend to agree with that. Let me come back to one thing I meant to ask you in connection with commuting, and actually more than commuting because we think of commuting as just being home to work and work to home. But the utilitarian use of a bike, for running errands, etc. What do you see as being the impediments to someone who is giving thought to actually taking that up? LM: Cars are convenient. They are big and you can throw your groceries in the back and you can go to stores without any thought process or whatever of your shopping list. I can go to the store and have a shopping list and I have to keep to it. I had one occasion I had to go back in and buy some strapping tape. I had to strap stuff onto my bike because I overbought. So I do keep bungee cords on my bike just for that reason, where I might have to strap a grocery bag on the back of my rack because I overfilled my panniers. CU: Of course, now you could get one of those new cargo bikes. LM: Yeah, I could get a cargo bike. I haven’t gotten there yet because my kids are out of the house so I am empty nesting. But there are some inconveniences about using a bike. Obviously, it takes a little bit longer to get to places and if you’re running from one place to another to another, picking up stuff, there are some limitations. I have carried up to 80 pounds on my bike front, and rear panniers, for this and that, on shopping trips. So there are some inconveniences without a doubt. But it is primarily about attitude. I think once you overcome the attitude [and decide] “This is what I am going to do and I plan on doing it,” then it is going to happen. If you have a family that has a car, it is too tempting to hop into a car, and you get habituated too easily to hopping in a car and going places. To go to a restaurant, really it doesn’t take that much to ride your bike to a close restaurant or a coffee house or whatever. Shopping isn’t really a big deal, once you get used to it, and again have an attitude that this is something that you want to do and you do it. I ride a lot at nighttime. It is not for the faint of heart and it can have some challenges to it. I think my experience of riding is so well-versed that even at night time I don’t think my risks are that much great than driving a car because of my level of experience on a bike. I think that is a problem with a lot of people; you have to get over that hump. I have read the “Art of Urban Cycling” [by] Robert Hurst. He says it takes about 5,000 miles to start feeling comfortable as a bike commuter, which is about 1,500 miles a year for three years. Thereabout your risks are dramatically dropped, your confidence level and knowledge are increased, you understand risks and you are very comfortable with things of that nature. I think that once people get over that hump, that 5,000 mile, 10,000 hours kind of mentality, once you get to a certain point, then you become an expert and then it is so much easier to bike commute and to use your bike in a utilitarian fashion. CU: So a person just needs to realize that there is going to be that learning curve. LM: Absolutely. Personally, I think people are just too embarrassed to ask for help because they are riding a bicycle and they think this is a kid’s toy. And therefore they are too embarrassed to take a [League of American Bicyclists] Road 1 course or too embarrassed to have people help them out because it is a child’s toy and they should be able to ride without any problems. It does take a huge amount of thought process. Even at the same intersection, depending on which way you approach it, that could be a completely different intersection whether you come from north, south, east, or west, the time of day, the intersection completely changes in how you read the traffic there and how you interact with that intersection. You learn that through experience, then it becomes second nature. But you have to go through that learning curve as you said to get to that point. LM: A lot of people are not willing to do that. CU: You mentioned a couple, but what are the resources available to somebody who is looking to get started or who has just started commuting. Where can they go to find out how to do it? LM: First, you have to learn how to ride a bike and be comfortable on a bike. Go through a [League of American Bicyclists] Road 1 course, or just riding your bike a lot. I can’t emphasis experience enough. How do you negotiate a 2×4 laying in the road, or a bunch of gravel, or a bunch of rocks or potholes, or a road that has no shoulder versus one that has a three foot shoulder? All of these take experience and comfort. It is just pure experience. The Road 1 course is a big help. There are [local] instructors. CU: So if someone is interested in that, they could just go to the League of American Bicyclists website. LM: Get on the website and get with an instructor. Mary Margaret Williams through the BCC gives courses. They do Road 1 courses and periodic learning improvements. I think reading cycling utah’s commuter column, they can learn tips. You can google bike commuting and can get all sorts of assistance, but nothing beats the experience of actually doing it. Even in the Road 1 course, they will saw the safest riders are those who ride in all kinds of weather and all kinds of day and night and have many miles underneath their belt. The more you do it, the safer you are. Hurst in his book will talk about people like me. He will say in his book that my risk of accidents and such is almost negligible compared to me riding in a car. And once you hit a certain amount of time, your risk of accidents drops off. No different than a 17 year old driving a car and a 35 year old family man. Same thought process. The 17 year old doesn’t have a clue what to think about as he is driving down a street because he has no experience. The 35 year old, through experience, is scanning driveways, he is scanning this, he is scanning that, subconsciously as a defensive driver. CU: One final question that comes back to touring. If you were to pick your ideal tour, not that you have taken, I think I know what that is, your cross country tour, but if you were going to pick one final ideal bike tour to take, what would that be? LM: I would do a cross-country again. Adventure Cycling has three major cross country routes, Northern Tier, Southern Tier, and the Trans-America which was their original bike tour in 1976. I would say right now the number one tour on my bucket list, in the United States, that is, is the Great Divide Trail which is an off road tour, because that combines my level of back packing with bike touring and I’m in the back country. To me, that would be the ideal tour. I think it goes up into Canada now, but still, the United States portion is 2,750 miles, I think. That would be, to me, the ideal tour. An off-road, self-supported bike tour. It would be ideal. It would combine my love of backpacking and being in the back-country, and even though I think 80% of it is dual track, gravel roads, it is still not with a lot of traffic and such. Again, I would go cross-country again in a heartbeat if I had the time and opportunity to do that. I wouldn’t hesitate to do the northern tier. CU: What about if you would go outside of the United States? LM: I would like to spend about six months in Europe, even as grumpy as I am about this Germany trip. It is just a lot of money for the short time that I am doing it. [Normally] for both my wife and, we spend about $40.00 a dollars a day [when touring]. This trip, including airfare, is going to cost about $200.00 a day. And my background is, I’m not a vacation person. When I was growing up as a kid, my dad was a laborer and would work 13 out of 14 days. We went down to the shore which was 30 miles away from my home once a year. We would go down to the beach, maybe go on a boardwalk a bit, and that was our vacation every year. I never had a vacation until I became an adult. So it is hard for me to do vacations that are expensive and what would be considered luxurious. This European trip will be a lot, but I wouldn’t mind spending six months over there. That would reduce my overall costs by a large amount, and I would get into northern Europe and eastern Europe, France, Spain, Switzerland, etc. and so forth. LM: I’m not interested at this point traveling through India and Pakistan and doing bike tours through these nations. Too many cyclists I have talked to talk of dysentery, disease, bad food and etc and so forth. I think a lot of Europeans go there because they can get away with a long bike trip very cheaply. A lot of them are spending $10.00 a day or less, a lot of these European cyclists when they do these mega tours of one or two years. LM: No, I think we covered a lot of territory here. I would just like to say that I wish I could see more people out there using bikes in the utilitarian fashion, out there bike touring and not using vehicles. Not that I have anything against cars, they have been good for our society. It’s kind of like in my profession. I’m in medicine. I can give the right amount of medicine, I can make somebody better. If I give them too much medicine, I can make them toxic. I think that is where we are at in our society, where the right amount of cars keeps our country economically viable and strong, but we are at a point were we are a little toxic on cars, the air pollution, etc. and so forth. One Response to "An Interview with Lou Melini on Cycling as a Way of Life"